St Expedite, I am so grateful and thankful to your help in the most expeditious and speedy way. Thank you for delivering the justice I petitioned and asked for. Thank you Thank you Thank you! I will spread the word about your great help to me. Thank you Saint Expedite for granting me one of my petition with such speed. I’m in awe. I have faith that you will keep blessing me with your love & blessings! Glory to you Saint Expedite! Please bring my love back to me! I love you Saint Expedite… You Rock! I can’t find a Pound Cake in my city. Will Chiffon Cake be fine? Thanks for the reply. 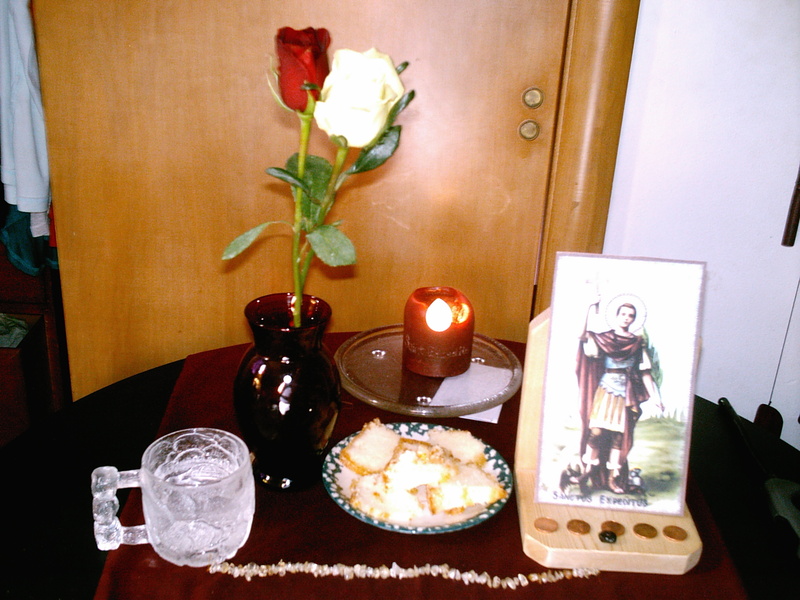 I have started praying for St. Expedite’s help last Wednesday night. In the morning that day, I went to church to have his image blessed with Holy Water. I printed you article with all the instructions in it, did everything stated in your instruction. For the first two days, I felt a gap when I prayed to Him. I felt uneasy. Maybe because it was my first time to talk to him and it was the first time I turned a Saint’s image upside down to ask for help. But when I started calling his name at random times yesterday asking for help and talked to him early today, I felt comfortable. It was like talking to a friend already. I made another copy of my request and read it while the original copy was placed under the candle. 1. Am I doing the right thing? 3. How long did you wait for his answer? I am so so SO sorry for the great delay in writing back, I had a cold and took a vacation from technology and just now getting back to things. I hope things went well, it sounds like you did everything wonderfully and yes, you can burn the black candle along with the red one. Don’t be disappointed if things don’t happen right away, in my experience it has taken a few days and sometimes a week after the seventh day for an answer. Here’s a story for you that I hope helps…Shortly, after I graduated college, I began petitioning St. Expedite to help get a job. I petitioned for one week, then two, then a month and still I didn’t have a job even though I was putting out my resume and everything. For a year and a half, I was angry and sad at myself and at my situation and even upset at St. Expedite and the universe. One day, I’m not sure when the though came into my head that I am my own worst enemy. I know it sounds cheesy but it turned out to be true. I realized that the reason I went directly to St. Expedite when I graduated was because I had so much doubt and fear in myself that I couldn’t get the job I needed on my own. That doubt and fear bled into my spell work with thoughts like “Am I doing this right, maybe I screwed up somehow, I’m a failure, Maybe I forgot something, This isn’t going to work this time, what if it doesn’t work”. I always believed that whatever energy you put out into the world, comes back to you. Because I believed that I had screwed up somehow and that it wasn’t going to work, it didn’t. This past March, I found a job online through a temp service that I thought I could do well in. I had interviewed with the temp service before and it was a complete letdown. Doubts started coming again but I pushed them away and emailed and left them a voice mail about my interest in the job. Afterward, the thought came into my head, “This is a good time to petition St. Expedite.” I listened and began a week petition not for that specific job but just for a any position that I could gain work experience, temporary or not. I was ready and whenever doubt or fear would come into my thoughts, I pushed it way and repeated my petition until the small red candle burned out. When I was out and about and doubt came into my mind, I focused on my St. Expedite medal and repeated the petition until the thoughts went away. Back to the temp service, for some reason they refused to call me back or email for about three days so I left more messages. I came to the conclusion that if they didn’t want to call me back, that was a loss to them and it wasn’t meant to be. Three days after I finished my seven day petition, it’s Ostara, I’m outside feeding the garden feeling good and positive. The moment I come back into the house, the phone rings and it’s the temp service who offer me not the temp position I originally wanted but one even better at the local medical college. The main thing of my very long story is don’t doubt yourself. Magick like anything else in life doesn’t work unless you put the work and intent into it. I hope things are well for you. Again I and very sorry for not getting back to you until now. I hope you are feeling better now. And your story is quite very inspiring. It has been more or less three weeks now that I am petitioning to St. Expedite. Yes, I admit, at first I was doubtful not because I didn’t trust him but because it was my first time to do a ritual or spell or whatever you call it to an exclusive Saint. I do pray everyday but not with the ritual as your instructions says. Later on, while I didn’t receive a reply from you, I did a lot of research again and learned a lot of things. How our faith, the energy and science are connected. But until today, I didn’t stop my petition (and he is still in his upside down position 🙂 I hope he understands that). I also told him that I can’t wait for the day the I will be seeing his image in an upright position already with the cakes and flowers in his altar. Aside from the prayer, I just simply talk to him like talking to a friend. I greet him a good evening when I arrive home from work, a goodnight before I sleep and a good morning before I prepare myself to work. Until today, I am still waiting for my prayers to be answered. Would you please tell me do you give St. Expedite a deadline when you petition St. Expedite? Upside down means face down and legs up or the picture should be lying turned over so I don’t see the image? And,, isn’t it disrespectful for him to stay in such position until he answers? I am moving into a room in a shared flat. I don’t know what to do. They might find out and consider me a witch and Harris me. Also they might see a flickering flame in the dark and tell the landlord because it might be forbidden by the insurance company to light anything in the rooms. I am out of idea what will I do from now on. Can I pack everything and hide after each service every day and set it up again the next day? The room has no key and I am afraid they might open it when I am out. Hi Ricky, that’s perfectly fine. I do the same thing now( do to lack of space) Just make sure the candle is completely cool before you pack it way. Thank you Sam. It’s very comforting to know it can be done in variation and that it doesn’t reduce the potency of the spell. I am sorry for my late response, I was not available emotionally for anything apart the to the basic necessities of life since I moved. But now better. Thank you Sam. It’s very comforting to know it can be done in variation and that it doesn’t reduce the potency of the spell. I am sorry for my late response, I was not available emotionally for anything apart the to the basic necessities of life since I moved. But now better. Have a happy new year! May all your wishes will get fulfilled Amen!